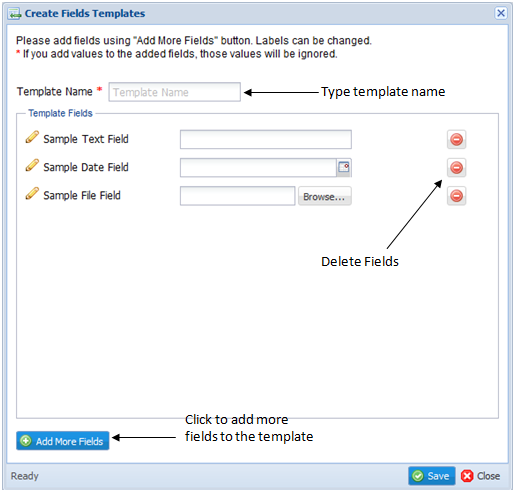 Manage Fields Template allows users to perform all the functions related to management of Fields Templates in your system. You can create new fields in templates, edit/ delete existing Fields Templates. This option is available only for “Admin” type users of the system. Steps: Go to “Jobs” tab -> -> Click on in “Jobs” toolbar, to open “Manage Fields Templates” window. Note: Using “Manage Fields Templates” window, you can create/ edit/ delete fields templates, view template details, search templates as well as view deleted templates. Step 1: Go to “Jobs” tab -> Click on in “Jobs” toolbar. Step 2: Click on button in “Manage Fields Templates” window, to open “Create Fields Templates” window. Step 4: Edit the [Template Fields Names] by clicking on “Edit” icon. Note: The default template comes with three template fields consist of a text field, date field and a file upload field. If a user requires removing a filed, click on “Remove” icon in-front of the template field. Any values added for the field(s) on template-level will be ignored, as at the template-level users are allowed only to specify the template fields, not values. If a user requires adding more fields, click on button and follow below steps. Step 5: In window you can select additional fields to include in your “Field Template” by clicking button in-front of each field. Refer Lists section in the Help Guide for step by step guide to create custom lists. Step 6: Finally, click on button to apply changes to the template. Step 1: Go to “Jobs” tab -> Click on “Manage Fields Template” button. Step 2: Click on “Edit” button in the template which you wish to edit. Step 3: Make necessary changes and click button. Step 2: Click on “Delete” button in the template which you wish to delete. Step 3: Click to confirm the deletion on below confirmation box. Note: This is not a permanent removal of Template. You can view the deleted templates by clicking on “Show with deleted templates” option in the “Manage Fields Templates” window as below. To view deleted templates, click on option in templates toolbar. Note: If you need to restore a deleted template, click on “Make this template available” icon and click on “Yes” button in the confirmation pop-up box. 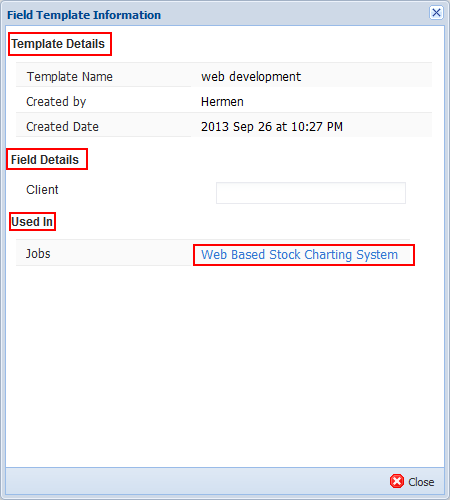 Step 2: Click on “Template Details” button in the template to view “Template Information”. Note: In the “Used In” section, you can find related Jobs which have used the selected template.